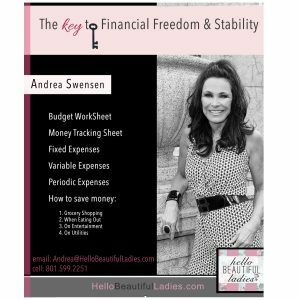 ASK ANDREA shares tips for Financial Freedom & Stability in this free Downloadable Work Book & Video. Complete with a Money Saving Guide, Budget Work Sheets, Money Tracking Sheets and information on how to get free from debt. Have you ever wondered why the end of the month comes around and you’re out of money? Does it keep happening over and over? Are you finding it difficult to keep to a budget? Do you find yourself robbing Peter to pay Paul? Are you paying high-interest rates on credit cards? Are you in debt and struggling to make ends meet? Then this FREE guide is for you.